The Bike North Century Challenge (BNCC) is an annual personal challenge event for members held in late April or early May each year (Sunday 6 May in 2018). 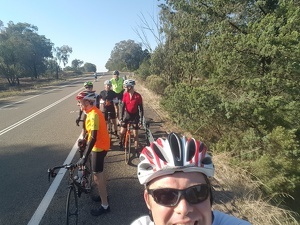 Each small riding group consisting of 2, 3 or 4 riders stays together over difficult and testing terrain to reach the goal of finishing the route they have chosen. There is a choice of 30km, 60km, 100km or 130km which correspond to our various ride grades. All riders meet up for a post event celebration. For many members this is the culmination of long preparation and is sometimes the biggest challenge of the year. This is in no way a competitive event. All the route choices take hard and hilly routes with significant amounts of climbing (and descending). The idea is that you step up to the challenge to extend your fitness and stamina. With higher levels of fitness and stamina you will enjoy all your cycling more whether you cycle for transport, for fitness or for recreation. All routes, however, have shortcuts which riders can choose if they feel they cannot complete the full course. The Bike North Challenge is only open to members but you can easily join Bike North. You must register to take part. There will be no late entries or entries accepted on the day of the event. In 2018, the BNCC will also be a navigational and timing challenge. Profiles and climb data are available using the Ride With GPS Links under the appropriate rides on our Calendar. Participant are required to nominate a start time and are required to complete the event by 1 pm at Bicentennial Park to complete the Challenge. You can view an Register via the Rides Calendar. Links to each of the challenge rides are listed below. The plan on the day is to have as many participants as possible at the finish at the same time to share in the success of all the other riders. The catering at the end will enable you to refuel and celebrate, so please plan to stay around as long as you can. This event started in 2002 and has been run each year with hundreds of successful participants taking part. Information and articles about previous events will be available at the event archive in the near future.